Mozambique offers some of the world's best fishing and some of the most challenging big game fishing in southern Africa, particularly around Guinjata Bay and the deep waters of the Mozambique Channel. The Bazaruto and Quirimbas Archipelagos are considered among the best fishing destinations in Mozambique, but there are many other wonderful options, with almost every lodge and beach resort offering a range of fishing activities and tours. Black, blue and striped marlin, sailfish, shortbill spearfish, wahoo, dorado, various tuna species, king and queen mackerel, barracuda, and snapper are among the huge variety of fish species found in Mozambique's rich waters. The Bazaruto Archipelago is one of the best destinations in the world to find black marlin. The best season for fly-fishing is from March to July, and although game fishing takes place all year round, marlin season runs from October to January, and sailfish season from June until the end of September. With some catches weighing over 1,000 pounds (454kg), a number of records have been set along the coast. However, a catch and release system is encouraged to protect the natural resources, so fishermen often have to make do with photographs as trophies. With a number of centres along the coast offering spear fishing, surf fishing, estuary fishing, offshore fishing, and fly-fishing, there is something to appeal to any level of expertise and experience. 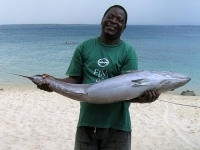 There are also a number of tour operators offering multi-day fishing tours in Mozambique. While visitors should enquire about any necessary fishing permits at their hotel or resort.